BRANDON, Man. – If you’ve ever fallen in love – or out of it – Brandon University Theatre has the show for you. 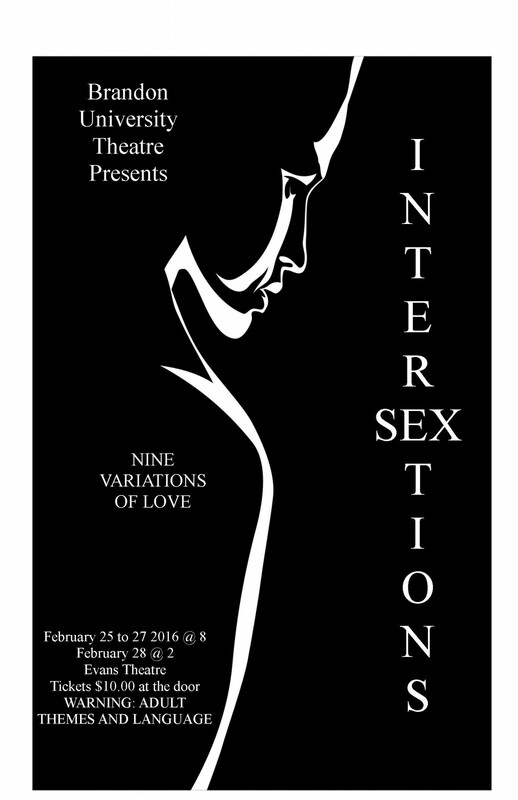 Brandon University Theatre is proud to present something completely different for its major production this year: Intersextions is not just one play, but nine separate scripts varying from seven to 18 minutes in length. All nine are by award-winning playwrights, including John Patrick Shanley, the screenwriter of Doubt and Moonstruck, Jane Martin, Jacquelyn Reingold, and Nicholas Pappas. Together they present nine different variations on love and relationships. Sometimes love can be shy and tentative, and sometimes it can be frightening and predatory—but these are nine examples of why it makes the world go round. This an adult-oriented event, said director and longtime BU theatre professor James Forsythe. Forsythe said Intersextions aims to be a challenging cocktail of situational comedy and thought-provoking drama with a garnish of violence. It features a stellar BU student cast of nine women and nine men. Their performance is augmented by live music to set the mood of each individual play. Intersextions runs Thursday to Saturday, Feb. 25-27, at 8 p.m., and Sunday, Feb. 28 at 2 p.m. in the Evans Theatre on the BU campus, next to the John E. Robbins Library. Tickets are $10 at the door for rush seating. The show on Thursday, Feb. 25 is free for BU students.